This week, Egypt will celebrate the second anniversary of the Egyptian uprising and many walls in the country remain covered in graffiti, reminding passers-by of the historic changes that the Arab Spring brought to the region. When the revolution started, many forms of activism came up; street art being among the most popular. 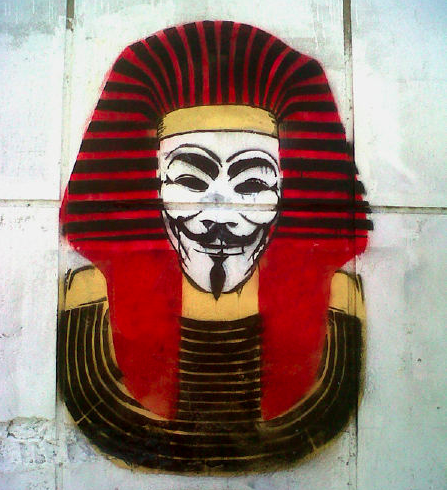 While Tahrir Square became the paramount place for the protests, the streets of Cairo transformed into a canvas that documented what was happening in the country. Much of this graffiti can be found today in a book called Wall Talk: graffiti of the Egyptian Revolution. Different Egyptian artists collaborated to publish a book with their work from the streets of Cairo. Graffiti is one of the purest and most sincere forms of expression for them. “This is our soul. This is documenting every battle, every fight”, explained Sherif Borai, the book’s editor. 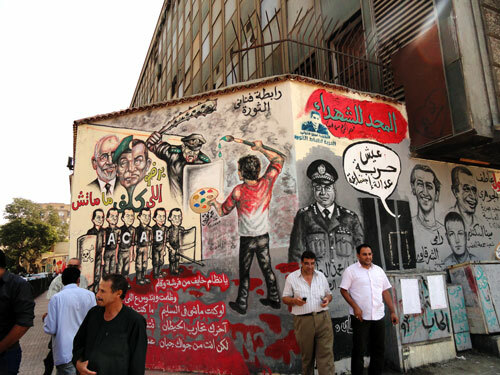 For example, portraits of “martyrs of the revolution” were drawn on walls and buildings of Cairo. 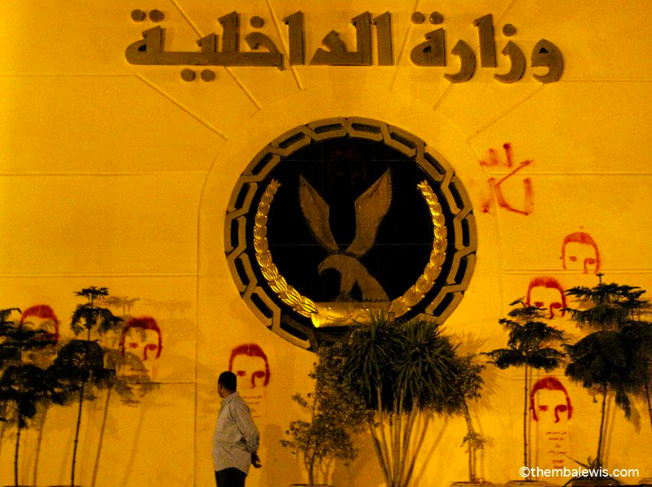 The face of Khaled Said was painted on the façade of the Interior Ministry. Khaled Said was one of the best-known cases, 28 year-old Egyptian from Alexandria that was arrested and brutality tortured by the police on 6 January 2010. A Facebook group was created in order to denounce his case. The page called “We are all Khaled Said” had thousands of supporters and protesters triggered in the main cities of Egypt. It galvanised Egyptian society, afraid and outraged that anyone could be Khaled Said, and it brought thousands of people to the street, being one of the seeds that would eventually grow into Egypt´s 25 January revolution. Another representative piece of graffiti is the eye sniper, as many protesters were shot in the eye by the police security forces during the demonstrations. One of the most famous examples is the case of Ahmed Harara, a 31-year old dentist, who lost the sight in both of his eyes. The first went during the “Friday of Anger” on 28 January 2011 when a policeman from the Central Security Forces (CSF) shot at him. The second was a few months later, on 20 November, when he was hit by a pellet in Mohamed Mahmoud Street. Some of the most popular works of graffiti were painted in Mohamed Mahmoud Street. It was an important artery for the protests as it connects the Interior Ministry with Tahrir Square and it was one of the bloodiest places as “more than 120 protesters were killed by the security forces in the first 17 months, 50 of them on this street”, stated Amnesty International. Although, the government attempted to erase and whitewash some of the graffiti , the artists went back to the streets and repainted them. “In Mohamed Mahmoud Street we can still see layers and layers of graffiti”, affirmed Sherif Borai. Before the revolution, the image of Hosni Mubarak “was never used in graffiti or anything else, talking about him in any way other than praise and nepotism wasn’t allowed”, explained Karem Ibrahim, Egyptian artist and activist. 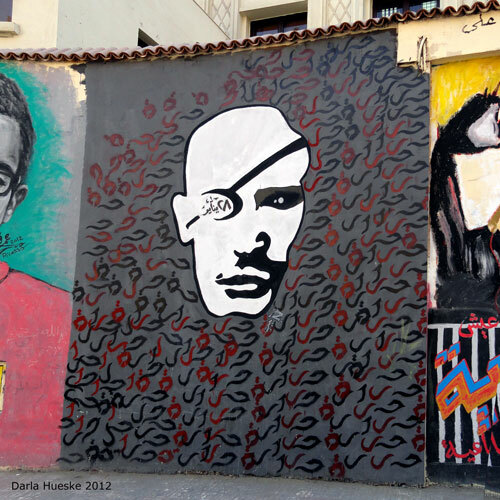 However, during and after the revolution, Mubarak has been one of the artists’ main targets. The same happened when Mohammed Morsi was elected President. 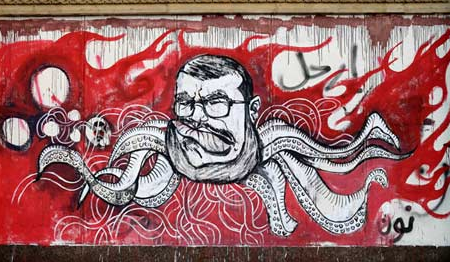 Karem affirmed, “his image was used so heavily in graffiti and other media forms to ridicule him and his party. Most of the time, there were no attempts from the Morsi camp to punish the makers”. The Egyptian uprising marked a milestone in the country’s history in all aspects. “After the revolution, people can say more, and more openly. The holy ring over the ruler’s head is broken and I don’t think it will be coming back any time soon”, stated the Egyptian activist. From the beginning of the Egyptian uprising, people were inspired to fight the regime. Not only with graffiti but with slogans that were heard all over the world, such as “Olna aeesh adala horya”, (We ask for bread, justice, and freedom), and “Ash-shaʻb yurid isqaṭ an-niẓam” (the people want the fall of the regime). They also used humour to create satirical sketches to describe that the status quo in the region had changed for good such as Le Journal du ZABA’s videos. Beautiful article! Love the title immediately followed by that powerful image, which introduces you very nicely into the text. Personally, I would change the first sentence in the last paragraph into something like; “Since the Egyptian uprising began, people are becoming inspired to fight the regime”. This is cos I think is an ongoing phenomena. Neither the uprising, nor the revolution, nor the regime are over. Thank you for using my images to illustrate your article. Very nice job of reporting.